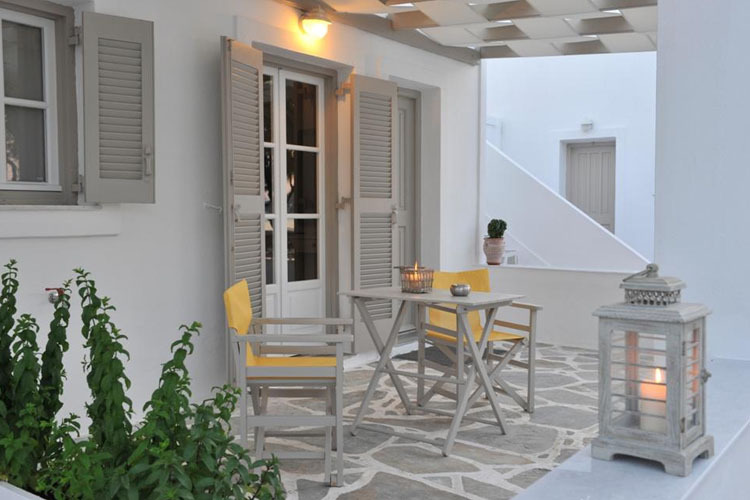 Fikia, 84401, Naoussa, Paros, Cyclades Islands, GREECE. 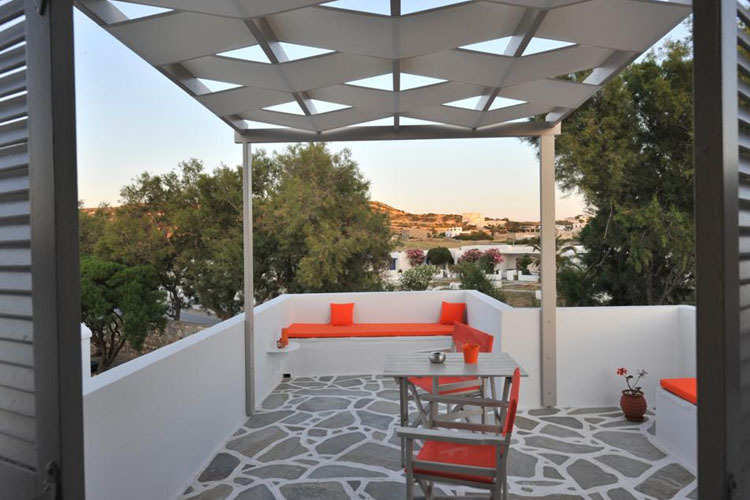 Standing on the shores of Naoussa bay, Almira Suites enjoys a delightful waterfront location on the north-eastern coast of the island of Paros. 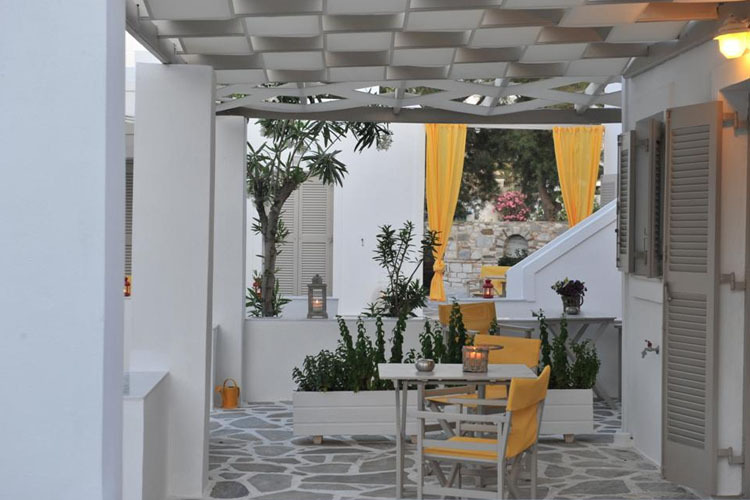 Almira Suites is a small, family-run hotel, and offers cosy bed and breakfast accommodation in Cycladic-style studios and Suites with views over the Aegean Sea and the bay, in an atmosphere of friendly, traditional Greek hospitality. 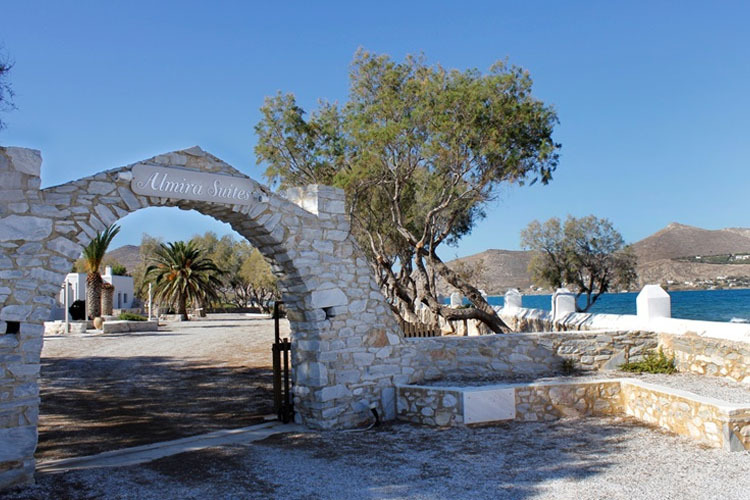 Ideally placed for exploring this charming island, or simply relaxing by the sea, Almira Suites is within easy reach of many of the island's most beautiful beaches, along with countless historic landmarks and attractions. 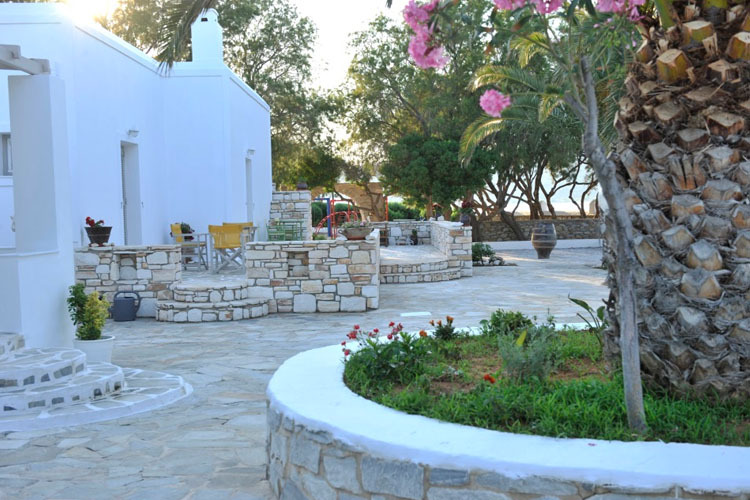 Highlights include the Panagia Ekatondapyliani church, the Frankish Kastro, or the Archaeological Museum. 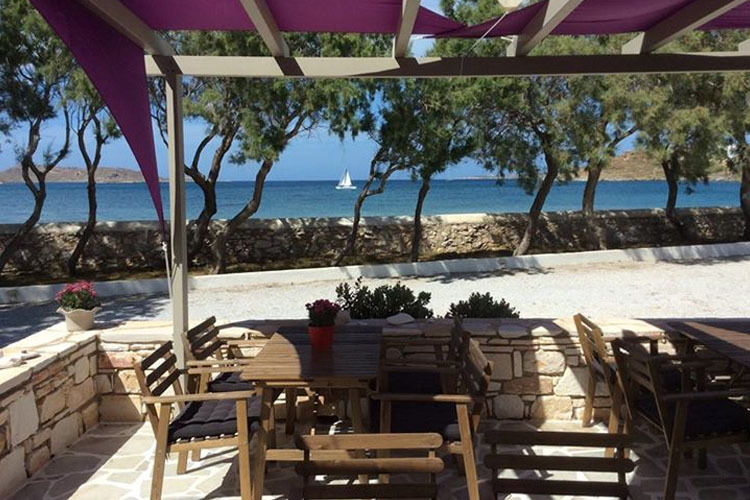 Popular activities on the island include hiking, cycling, snorkelling and water sports. 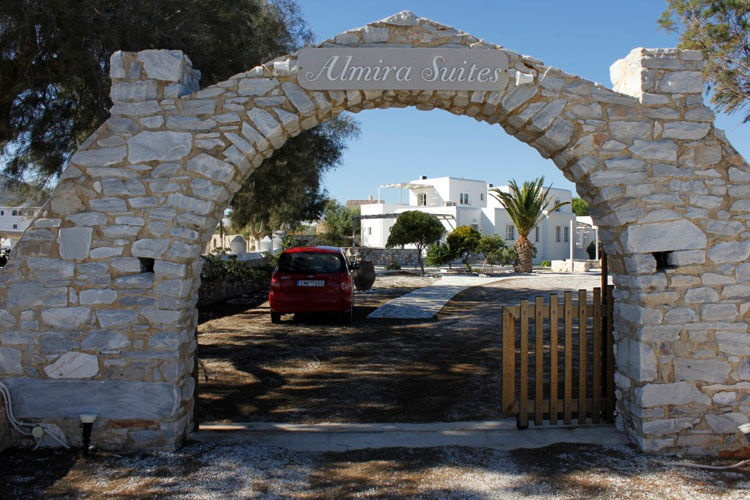 Facilities and services at Almira Suites include a delicious home-made buffet breakfast, free parking, a children's play area, and a snack bar. A full range of travel services is also available on request, including airport or port transfers, boat trips, and car and scooter hire. 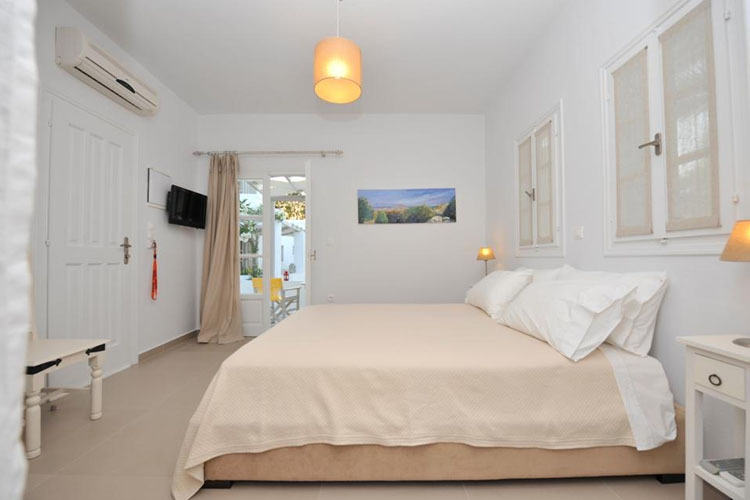 Studios are decorated in soft tones with light wood furnishings and overlook the Aegean Sea. The spacious Studios can accommodate 2 persons. 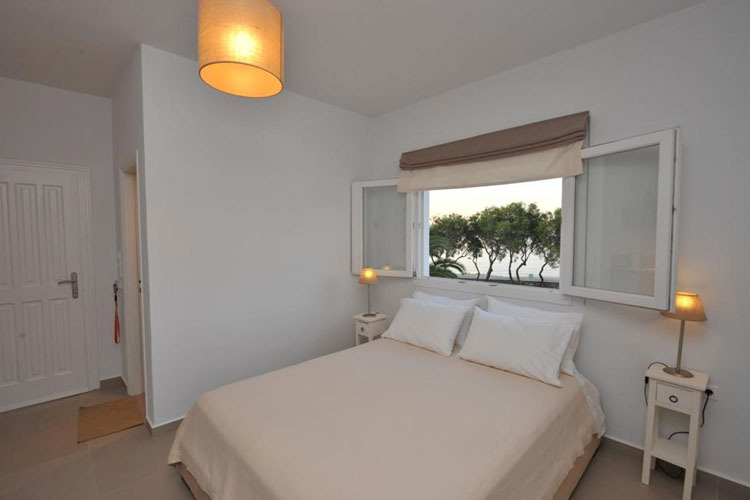 All studios have a balcony or veranda with sea view or seaside view. 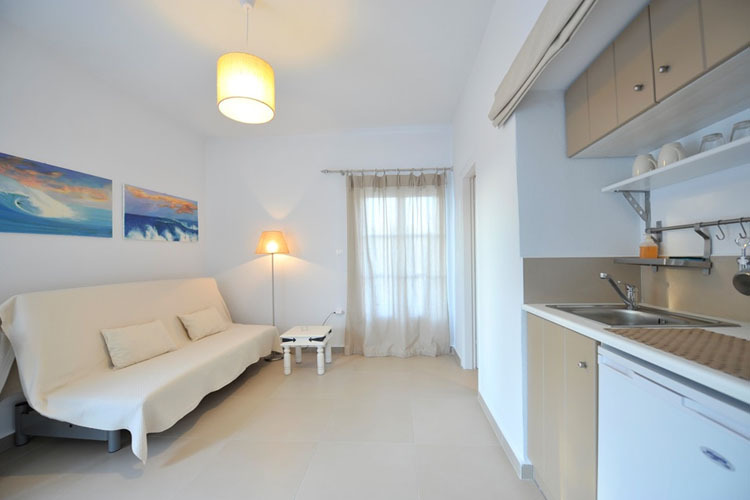 They are all equipped with a kitchenette that includes refrigerator, coffee machine, etc. Bathrooms have a toilet, shower and hair-dryer. They all have air-conditioning, flat-screen TV and free Wi-Fi connection. 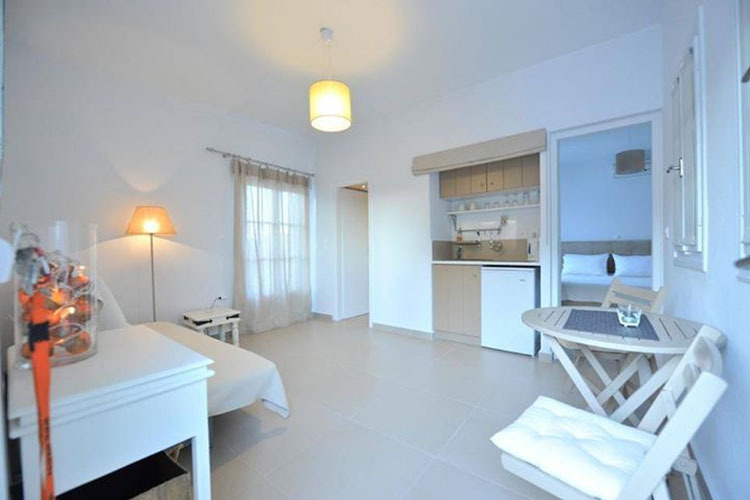 Studio size 20 sq m.
The Junior Suites can accommodate 2 to 3 persons. They have a veranda with a sea view and they are all equipped with kitchenette that includes a refrigerator and a coffee machine, etc. Bathrooms have a toilet, shower and hair-dryer. They all have air-conditioning, flat-screen TV and free Wi-Fi connection. 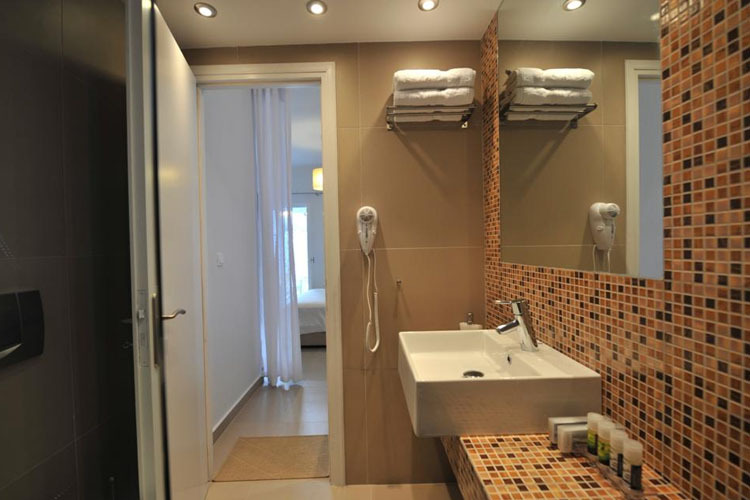 Suite size 25 sq m.
Suites consist of two separate rooms that can accommodate 2 to 5 persons. 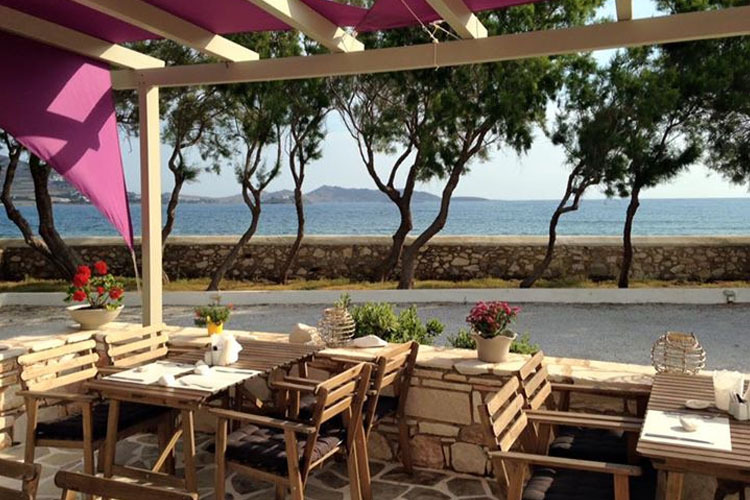 All suites have a balcony or veranda, with a sea view or seaside view. 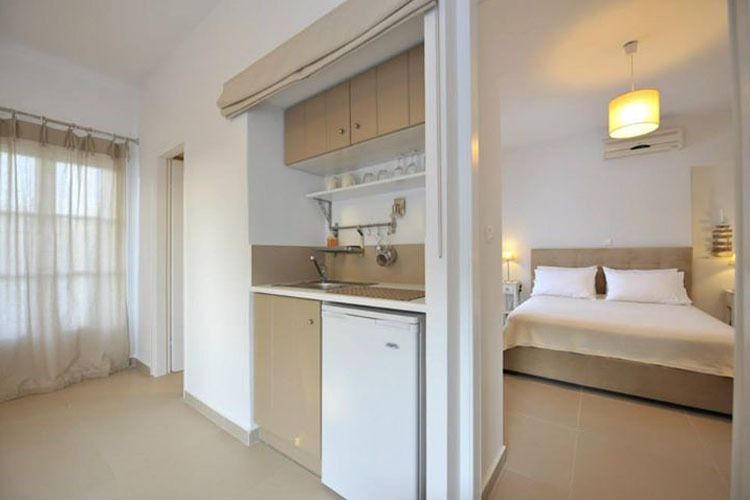 They are all equipped with a kitchenette that includes a refrigerator, coffee machine, etc. Bathrooms have toilet, shower and hair-dryer. They all have Air Condition, flat TV and Wi-Fi connection. 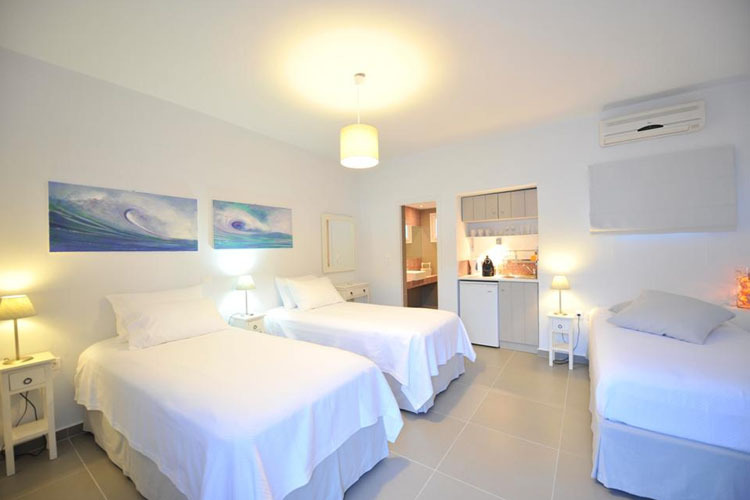 Suite size 35 to 40 sq m.
All units come with: bath amenities; bathroom with bathtub or shower; coffee-making facilities; hair-dryer; individually controlled air-conditioning; kitchenette; modern furnishings; private balcony or terrace; sea view; television; Wi-Fi internet access (free of charge). Paros National Airport is served by flights from Athens. There are also regular ferry connections to and from Piraeus, Rafina and Lavrio and the surronding islands. Babysitters are available on prior request. Languages spoken: Greek, English, French, Italian. 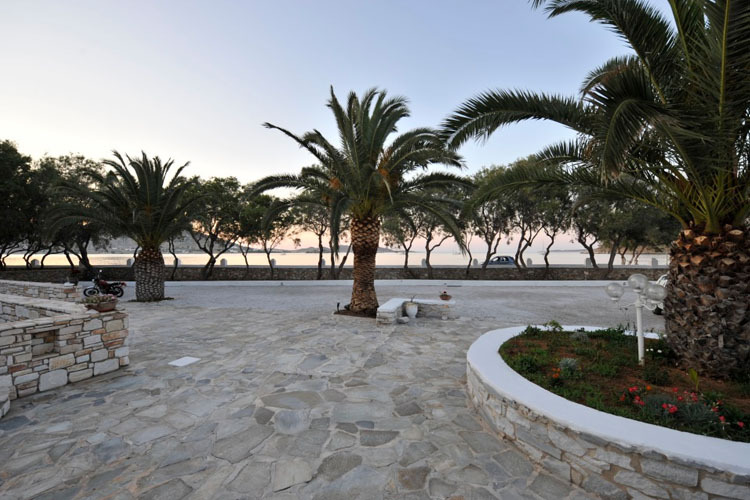 Nearest airport: Paros National Airport - 18,4 km. Beach Waterfront property. Kolibithres Beach 1 km.